The Evil DM: This is how I roll! : Plotting out encounters - "Encounter Squares"
This is pretty simple, I drag the NPC or Monster into this area, I also will jot down some notes on how I want the creature or NPC to act. I can also add little notes to myself about NPCs and how they should act towards a certain PCs. With Onenote it's real simple, you can copy an entire creature or npc with the collapsible tabs feature with one simple copy & paste (I'll show you this in a later post). Various things can be placed here, such as what location in the dungeon, wilderness or whatever. Weather situations can be added as well as land marks. Basically anything you'll need to remember about this encounter. "-2 to saves due to..."
This square, I can put in any major/minor events, from the past or things that will happen as a result of this encounter. 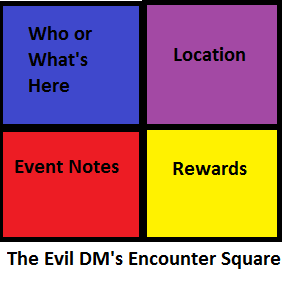 Some ideas for this square would be if you are tracking kingdoms or even races and how they feel towards the PCS. Such things as "fighting this NPC will result in -1 on the favors track". Here is where you can put things like treasure they will obtain from the encounter or even any extra XP for this encounter. Putting little notes as "this was a hard encounter, players who think outside the box get an extra 100xp". Sure you can jot all those things down afterwards, if you remember, but why not put the little note now and then while you are playing write down the player names right there as well. That is a great idea! I like the compartmentalized method of approaching encounter generation, instead of a checklist of required and optional elements. I'm going to use this going forward. I appreciate it!